This information is intended to give the reader a basic understanding of ingredients used in our products and the functions they perform. This information, is not intended to be used to make nutritional recommendations. If you have questions, please consult your independent Vet on any feeding or supplementation programs. All Equine Direct ®products have a guaranteed analysis that has been reviewed and approved by Equine Nutritional Professionals. Equine Direct® formulates all of its blends with the best known active ingredients available. We believe we are the most complete, best value products on the market for equine use. However, these products do not come with any guarantee of performance and should never be represented in that fashion. There are 22 known amino acids. The construction material from which protein is made. There are two groups, essential: The critically important amino acid which the body can not manufacturer such as lysine, trypthophan, leucine methionine, phenylalanie and valine. Non-essential amino acids which the body can manufacturer such as cystein, cystine, tyrosine, arginie glutamic acid ect.. Any amino acid can be considered essential under conditions of stress, disease, trauma, intense sporting activity, poor diet and malnutrition. Biotin is a water soluble vitamin classified as a B complex vitamin. It functions as a co-enzyme and is normally produced by healthy intestinal bacteria. Biotin helps maintain healthy skin and hooves including the hoof wall, sole, frog and white line. Biotin therapy is long term and can take up to six months to one year to show improvement. Biotin has been around for 60 years and is not known to be toxic. No toxicity has been reported in human use with daily doses up to 200 mg. Biotin has been the main active ingredient in horse hoof products for many years. Chondroitin sulfate is a macopolysaccharide-a major part of cartilaginous material found in joints, ligaments, tendons, and other connective tissue. An agent that stimulates the production of cartilage. Chondroitin is used in the treatment and prevention of arthritis and joint inflammation, wound healing and blood vessel damage. Chondroitin is well absorbed into most tissue including cartilage and synovial fluid. 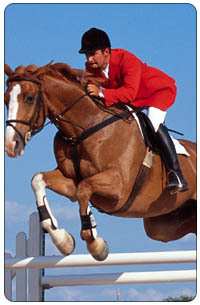 Chondroitin has been used in human and horse products for many years, and is usually combined with glucosamine. This therapy is long term and may take three to four months to see results. A water soluble compound found in fruits and vegetables. Also known as a Vitamin P. It is an antioxidant and is essential for the proper absorption and use of Vitamin C. It has the ability to cross link collagen fibers that form the collagen matrix of connective tissue. (Ground substance of cartilage and tendons). It inhibits the release and synthesis of compounds that promote inflammation such as histamine. Maintains the normal state of the walls of blood vessels. Copper Amino Acid Chelate is used in the formation of hemoglobin as well as bone and cartilage. It also helps utilize iron and improves the color and structure of hair and hooves. The level of copper in our products is safe and similar to many other equine products on the market. To much copper in a diet, over a period of time can cause serious problems and even death. Methionine is an amino acid and aids in the utilization of niacinamide and glucosamine. Methionine also helps proteins in the connective tissue and delivery of many other agents in the body as well as absorption of Biotin for hoof development. Glucosamine HCL is typically made from shellfish, specifically from the chitin the major carbohydrate in the shells of shrimp. This is what we use in our products. The sulfate form is chemically synthesized and requires higher levels of supplementation. Glucosamine is the single most important component in connective tissue. Hyaluronic acid, Collagen and Chondroitin require or consist of Glucosamine. Cartilage cells manufacturer glucosamine. Scientific studies show that glucosamine yields as good results, compared with traditional anti-inflammatory drugs. Supplementation maintains and repairs connective tissue (ligaments, tendons, cartilage). Trials have found glucosamine to be safe and this ingredient has been used in human and equine products for years. Proline is an amino acid (see amino acid) it is involved with the Collagen structure. Lysine is one of the most important amino acids and is involved with protein synthesis that affects all parts of the body. Lysine is found to be deficient in many animal diets, and is widely used in animal feeds and supplements to insure proper levels. Younger horses that are still growing require higher levels then mature horses. Manganese is an amino acid (see amino acid) and is an important component of cartilage as well as helps synthesis glucosamine. MSM is necessary for the structural integrity of connective tissue. MSM has been shown to decrease joint inflammation and degeneration. It is a necessary part of healthy ligaments, tendons and all connective tissue. It is believed that MSM relieves swelling, inflammation and joint pain, in part by allowing the body, (including joints) to increase circulation thus allowing harmful substances to flow out while nutrients flow in. MSM acts similar to glucosamine. Mineral Oil supports healthy shinny coats and also helps the formulation to be less dusty when many ingredients are blended. Molasses is used in the formulation for improving taste. Molasses also helps in keeping powdered product less dusty. Niacinamide is the more water-soluble form of the B Vitamin Niacin. It is used in the cells energy production and plays a role in the anti-inflammatory response of joints to stress. Probiotics is a term used to describe live organisms fed to humans and animals to help promote good intestinal balance and promote good bacteria in the gut. In return the good bacteria out-perform the bad bacteria to reduce things like; e-coli and other harmful bugs. Probiotics are used in animal feed to promote weight gain and support the immune system. Studies have shown that the use of Probiotics and Prebiotics may play a role in reducing colic in equine. Our Direct Microbial™ is a good source of an equine Probiotic. Pyridoxine is involved in more body function than almost any other nutrient. It is necessary for the production of Hydrochloric acid and the absorption of fats and proteins. Pyridoxine also aids in maintaining sodium and potassium balance as well as red blood cell formation. Pyridoxine activates many enzymes and aids in the absorption of Vitamin B12 in immune function and antibody production. Soybean Meal is a good source of protein and amino acids. It is used as a carrier and or filler in many animal formulations. Vitamin C aids in the synthesis of Collagen, Lysine and Proline. It is considered an anti-oxidant. In addition, it aids in the strength of tendon fibers. Yeast is used to increase palatability (taste) and also supports existing bacteria in the gut, which in turn supports many animal functions like the immune system, digestions mineral and vitamin uptake and absorption. Yucca extract comes from the Yucca plant and is used for its anti-inflammatory properties. Zinc is vital to 200 enzymes and is involved in formation of bone tissue, healthy skin healing of wounds, Vitamin A, metabolism, phosphorus absorption, linoleic acid, transformation, production of proteins and reinforces the immune system. To high of an intake of Zinc may compromise the absorption of Copper. Zinc Amino Acid Chelate has a higher absorption rate then standard Zinc.